Off of work for a few days, I am mostly lounging around and fighting a cold, but I felt a little better yesterday. I talked my mom into going to the farmers market with me, hoping to find some citrus fruit for ice rings and punch. Instead, we had a fantastic fried shrimp lunch at the NC Seafood Restaurant and purchased apples, strawberries, and spinach. 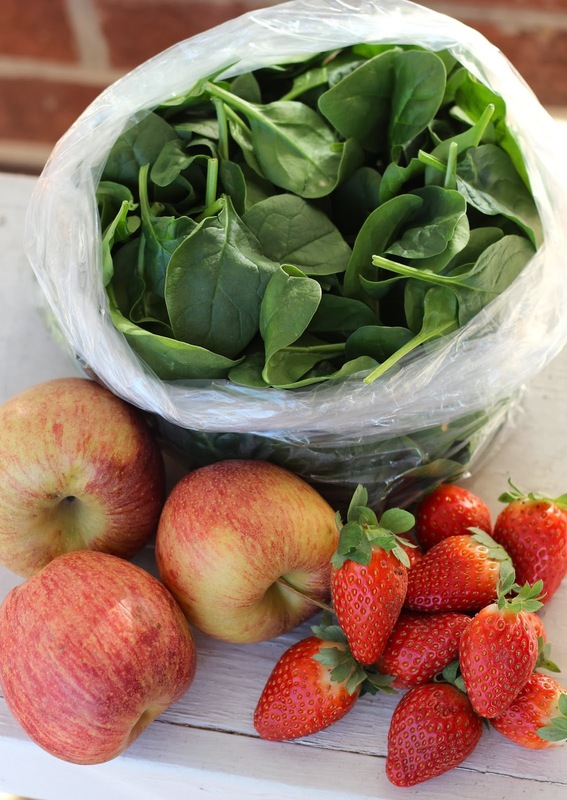 I have already snacked on an apple and used the berries and spinach in a smoothie. I plan to eat the spinach in salads, too. I learned from my dad this summer that NC produces plenty of apples. In the winter time, the varieties available increase significantly. I tried Pink Lady apples first yesterday, then the farmer suggested this Cameo variety. They are great! I was disappointed to have missed strawberry season this summer, but I was pleasantly surprised to find strawberries yesterday. These are "winter berries" from Lewis Nursery and Farms. According to this chart, I should be able to find NC grown strawberries all but three months of the year! What good news! What are your favorite winter time farmers market finds? Jealous over those strawberries, they look delicious! Your monogramed basket is so cute and such a great idea! Hope you feel better soon! Thanks! My mom gave me the basket a few years ago, and it's so useful!